Addable is a budget friendly gel memory foam mattress. Addable was conceived and designed by a fourth generation mattress maker. Addable is a budget friendly gel memory foam mattress. Addable was conceived and designed by a fourth generation mattress maker. Their mission with Addable is to make a best-in-class gel memory foam mattress and sell it at a price point no other mattress maker is at. What else sets them apart? Transparent pricing; an honest “not for everyone” approach; & your 181 day trial period. 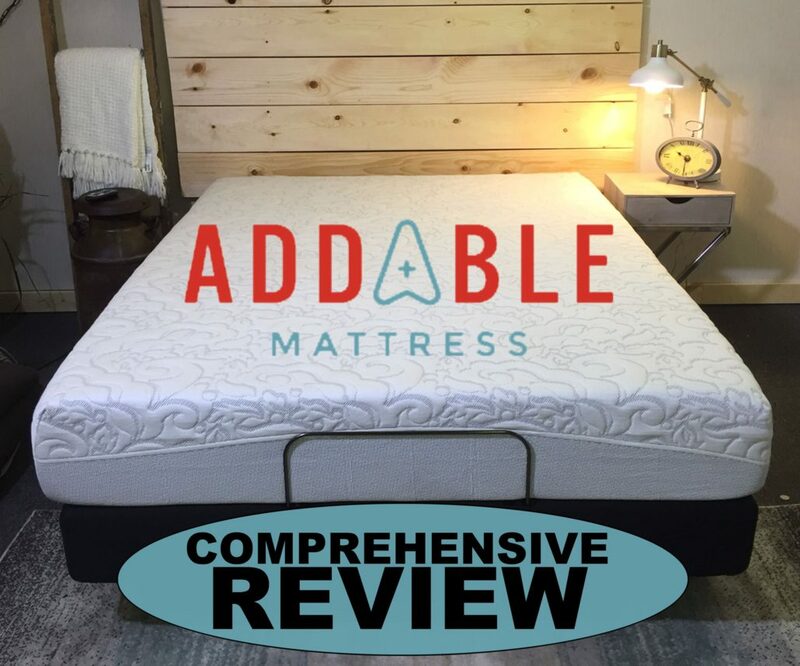 You want a good value – Addable is the best priced gel memory foam mattress with a long trial we have reviewed thus far. It has a good feel for the price as well. Like to sleep cool – Foam mattresses can sleep warm. However, the Addable uses a gel memory foam layer on top that sleeps cooler than traditional memory foam. I did not experience excessive heat at all. Sleep in multiple positions – This mattress is a good medium feel with good body conformance. Sleeping on your side, back or stomach Addable will conform to your body very well. Addable feels similar to some of the more expensive mattresses we have tried but comes in at a cheaper price. Are a stomach only sleeper. Addable slept well in all positions but if you only sleep on your stomach I would recommend a firmer mattress. Addable is a 3 layer mattress. 2″ of gel infused memory foam on the top layer. Addable uses a stretchy removal and washable cover. 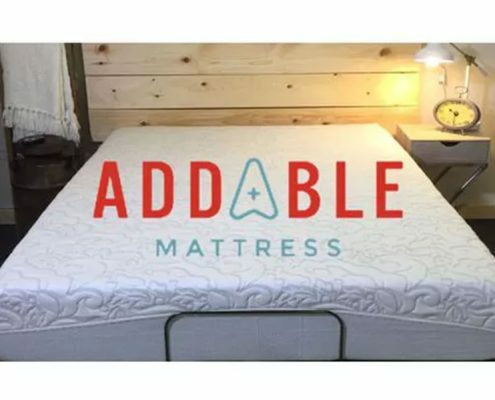 The Addable mattress will work great on any solid surface. Wood foundation, boxspring, slats, floor or an adjustable base. The biggest thing that stands out for the Addable is how it feels for the price while still offering a gel memory foam and not just a poly or regular memory foam like some others in this price range. The feel is a good medium at about a 6 on the firmness scale so it will work with all sleeping positions. If you’re a stomach only sleeper maybe look into something firmer. The motion transfer reduction is very good as well. It also slept cool. I enjoyed the Addable Mattress. Ross didn’t tell me the price until the 2nd day. Once I heard its $499 I was even more impressed with it. I’m only 125lbs so sometimes I think many of the beds we try are a tad firmer than I like. This felt a touch softer than some of the ones we have tried that have latex on top. So I liked that it conformed to my body better than some of the latex options we have tested. Addable fends against overheating with a thin cover, gel memory foam. I believe all mattresses will eventually heat up to your body temperature. Some foams disperse that heat better than others. The gel foam in this mattress seemed fairly porous which helps move air around better. We did not get excessively hot any of the nights we slept on the Addable. Take 5% OFF any size with our link. Discounts – Use our link above to receive 5% OFF. Addable is owned by seasoned veterans in the industry. They also own a couple other well known brands that hit the high end latex market. They are not a startup, so you may have to worry about going out of business a few years down the road. We really like their honest approach with Addable. They are not trying to trick you into thinking its the best mattress in the world and its perfect for everyone. With that said they still offer a very good trial period. 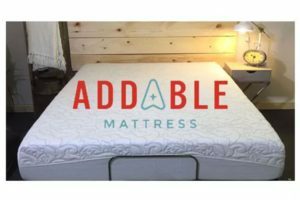 Addable is a fantastic choice for those of you looking to stay within a lower budget and still get a quality mattress. It works well with all sleeping positions, have very little motion transfer and stayed cool when sleeping. Overall, we were impressed with the quality and feel of the mattress for how little it costs.